My friend Janet recently visited the Purple Headquarters. Watch this video to get an insider look into the all new Purple mattress. Purple recently introduced a complete new range of hybrid mattresses that deliver greater comfort. Purple 2 has a 2-inch thick layer of smart comfort grid that offers better support than the Purple legacy mattress. If you already owned a purple mattress and hit the foam layer, you probably need more cushioning and that’s where Purple 2 comes into play. Good choice for people that are slightly heavy. Purple 2 has a 3-inch thick layer of smart comfort grid that delivers an added layer of comfort. Great for people who are looking for more cushiony feel. This one has a 4-inch thick layer of purple smart comfort grid that is ideal for people that are extremely heavy. Don’t opt for this one if you are not too heavy. If you’re looking for plush, don’t think of choosing 4 over 3 or 2. But if you need more cushioning, Purple 4 is the ideal choice for you. 23% of Americans face certain kinds of trouble while sleeping. Part of the reason is discomfort while trying to get into deep sleep. Users often switch between latex, memory and gel foam mattresses looking for the bed that gives them the perfect posture and support for aching muscles and pressure points, but all of these focus on only one of the features while compromising on the others. Purple Mattress is your one stop solution to all your sleep related problems and comfort requirements. Enjoy the therapeutic comfort while you read your favorite book and let your muscles relax. Providing you the right amount of softness and firmness continuously, Purple Mattress ensures you get a good night’s sleep and wake up refreshed. Say goodbye to sore muscles (Not like Chandler though), with the amazing pressure disseminating properties of the Purple bed. This purple mattress review goes through the specs in detail, and lets you decide whether or not it is a good fit for you. The purple mattress comprises of 3 layers to provide you maximum support without compromising on temperature and density. This mattress allows your spine to rest in its natural position and provides it with firm support from beneath. Since we tend to switch between different positions while sleeping, the mattress adjusts to your spinal alignment, delivering the highest level of comfort. It does so by maintaining your natural curve when sleeping on your back, and the straight position, when you’re sleeping on the side. This uniform spinal supports reduces backaches and spine related medical conditions. Perfect for individuals with osteoarthritis, the mattress is loaded with other features to make your jaws drop. Each one of us likes to sleep in their own specific way, whatever position provides us with maximum comfort. Since the Purple mattress is the epitome of comfort and luxury, it caters to the needs of all sleepers alike. Wondering whether this mattress can suit your specific needs? The Purple bed, through its uniform spinal support, lets your spine in its natural position whether you sleep on your back, stomach, or on the side. Maintains the natural curve when sleeping on your back, and keeps it straight if you’re a side sleeper. 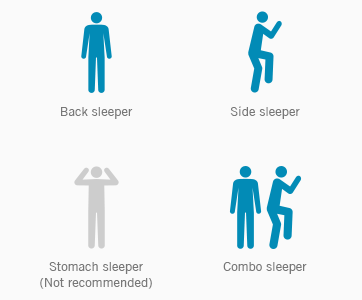 No more tossing and turning at night, especially for people who face problems sleeping and pregnant women, who can’t find the perfect sleeping position. Supporting every sleeper according to their body weight makes the Purple mattress highly customizable and tailored to suit everyone’s comfort level. While light weight sleepers experience a floating feel, medium weight individuals get to sink a little deeper, without being pressurized at a single point. Individuals who are overweight need not worry, as the mattress comprises of 3 layers to provide you with optimum support balancing the sinkage. Since the Purple Mattress is made from a combination of different materials, it possesses mixed qualities of all these materials combined. The hyper elastic polymer layer gives you the support of a latex foam, while its polyurethane foam disseminates body weight evenly. The hyper elastic polymer does not retain heat, eliminating any chances of heat build up. The webbed pockets are covered with a thin yet breathable fabric layer, making it the coolest mattress (literally) you’ll ever get your hands on. While there are other commercially available options that give the Purple mattress tough competition when it comes to comfort, none beats the combination of comfort and sleeping cool. While other mattresses rely on the thread count of the fabric to determine how hot or cool you will sleep, Purple bed comprises of air pockets in a grid like pattern that allow for air flow to keep you cool throughout the night. Purple’s grid pattern distributes the body weight evenly by forwarding the pressure to surrounding columns, not letting it gather at a certain point. By doing so, it alleviates pressure off your pressure points and you no longer wake up to sore muscles, numb feeling in the arm or pelvic and shoulder pain. Probably one of the greatest reasons to change mattresses is their inability to handle pressure and distribute it evenly. Pressure points are areas sensitive to pressure, found throughout our body at various points. This specific issue is addressed by the Purple’s Mattress grid pattern present in its top layer. The gel used in the mattress ensures that the foam does not sag too early. Unlike other mattresses, this mattress remains firm, even after continuous and long term usage, owing to its high density. Although it has the bounce of a latex mattress, it does not lose its spring like one. This definitely puts it above other mattresses. Since you’ll be investing a significant amount in the Purple Mattress, it is but natural to expect durability and longevity alongside quality. The comfort and coolness is of little use if the mattress isn’t going to last a while. Probably the only mattress to have passed the raw egg test, the Purple mattress is the perfect combination of firmness and softness. A mattress firm enough to provide support to all your pressure points and relieve backaches, and soft enough to cradle your shoulders and pelvic region. The raw egg test is proof that softness and firmness can indeed co-exist in a mattress. The raw egg test is an experiment in which raw eggs are thrown from a height of 3 feet on the Purple bed, and while they break on a variety of other mattresses, they stay intact on the Purple mattress. Purple Mattress relieves pressure not only physically, but mentally too. How so? By providing you an un-matchable warranty, it gives the competitor a tough edge. 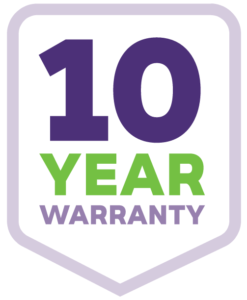 Since a mattress is not something you can test within hours or days, Purple bed allows you to use your product for 100 days, and if you’re not satisfied with the results, you are entitled to a complete refund. Amazing, isn’t it? Purple Mattress understands concerns from a consumer’s perspective and gives you with maximum comfort, whether its providing you uniform spinal support or simply the best money back guarantee deal. The 100 Nights risk-free trial is an excellent way to check if this mattress is good for you or not. If, for any reason, you are not comfortable sleeping on your Purple bed, you can send it back and get 100% refund. This is the beauty of Purple and one of the main reasons why everyone wanted to give it a shot. Mattress odor and material allergies are commonly experienced troubles when purchasing a new mattress. After finding out about the composition of the Purple bed, your next concern would be the odor and allergies associated with that. Purple Mattress takes care of that by giving you 100% hypoallergenic mattress material. Those of you who are allergic to plastic polymers have nothing to worry. Enjoy the comfort and luxury of this adjustable base mattress without compromising on your health. Does your partner toss and turns around all night? Are you unable to sleep because of the continuous movement of the person sleeping next to you? While no other mattress tends to address this particular issue, Purple Mattress with its no feel motion transfer does not allow the passing of movement from one end of the mattress to the other. The grid pattern confines the motion energy to its point of origin, hence no feeling on the other side of the bed. That does not compromise on the bounce level offered in this mattress, and is a win-win for both bounce and no bounce lovers. Since the Purple Mattress is different from your typical latex, memory and other spring foams, this no motion transfer feature makes it stand out among the rest. Although this can be found in a spring mattress too, those of you who do not want coils but great bounce nevertheless, Purple Mattress is definitely the best choice around. Why is that, you ask? The Purple bed is made up of three layers of foam and gel polymer, which differentiates it from others, giving it the bounce you long for. Bounce is a measure of how quickly the foam rebounds after pressure is applied, as opposed to simply sinking in. Purple mattress responds instantaneously to pressure applied, letting you reminisce childhood memories of jumping castles, minus the motion transfer. The Purple mattress is the ideal choice for couples, especially if one of you keeps tossing and turning throughout the night. Purple Mattress with its no feel motion transfer keeps movement confined to its point of origin. So you can sleep at peace, while your partner finds his/her perfect position. Purple Mattress is one of the finest choices to make if you are tired of sleeping hot and want your mattress to stay cool through the night. The grid like pattern of the Purple bed allows air to flow, and its gel polymer maintains normal temperature along the mattress. This keeps the mattress from retaining heat and getting warmed up during the night. The problem with other mattresses is their tendency to sink in when a slightly heavier weight is put on the mattress. This is where the Purple Mattress takes the lead. The three layers of the mattress are designed to support individuals of all body weight categories. The third layer of the mattress instantaneously responds to the pressure put, giving you a perfect combination of being cradled and bounce. Those of you who have changed quite a few mattresses, only to find out they still experience back and shoulder pain when they wake up, need to look no further. Purple mattress distributes weight evenly, alleviating pressure off your pressure points, that make the body go numb and sore while you sleep. Get your hands on the Purple mattress and say goodbye to sore muscles forever. Do you work from Bed? If you’re one of those people who like to do everything on the bed, from sleeping to reading to working, then the Purple bed suits you best. You can sit on this mattress for hours and hours, without going numb, (physical exercise is recommended though). Apart from that, if this is taken with the adjustable base, it can be set to any desired position, depending on whatever you’ll be doing next. Why Purple Mattress is the Best? Purple Mattress is highly customized yet suits the specific needs of its customers whether they are firm or soft mattress lovers. The perfect amount of bounce with a hug feeling as you jump into the bed is sure to make you fall asleep right away. That solves 23% Americans’ sleep problems. Bounce away as much as you want, without the person on the other end feeling anything. Sleeping hot is no more a problem as the Purple mattress gives you a cool airflow during the night with its grid like structure. On top of that, its 100 day warranty with a full refund policy definitely makes it a Shut up-and-take-my-money deal. Is Purple Bed worth it? While the answer to this question varies from customer to customer, we will evaluate the claims made by the company in terms of average customer response. The gel technology gives a cool feeling when you sleep on it, so people who sleep hot can definitely rely on the Purple mattress as a replacement. As far as the adjustment according to body structure is concerned, some customers may find the mattress too firm or too soft, depending on their own comfort level. Basically, the mattress is perfect for individuals who like to spend a lot of time on the bed and since you can change positions with the adjustable base, it has a lot to offer for a bed. Everything aside, the 100 day money back guarantee, beats all other warranties. Even if it turns out to be the most uncomfortable mattress, you can always return it with a complete refund. So it is definitely worth the try. If you have any questions about this purple bed review, feel free to contact me.